Not Tribbles, but Pickles. The trouble with dill pickles, specifically: the pickles have to rest and, well, pickle in their jars for at least two weeks before they’re ready to eat. At that time, if the pickle recipe didn’t work or if I messed it up somehow, it’ll be too late to go to the farm markets and buy pickling cucumbers. They’ll be out of season. Meanwhile, I’ll just hope the new-to-me-recipe for dill pickles is successful. The trouble with canned tomatoes (diced or chopped, in my kitchen) is that the preparation takes a long time and a lot of effort. Dig out the stem, blanch and peel, chop, and then pack tightly into a jar. All of that happens before I can even consider putting the liquid in the jars, checking the head space, and then actually processing in the hot water bath canner. On top of all this, I have to hope that I packed the tomatoes tightly enough to avoid the perfectly functional but perfectly ugly Fruit Float. The trouble with bread and butter sweet pickles; my food processor cuts the pickles too thin, so I have to cut them by hand. The food processor just died, so I’m glad cutting the pickles by hand is my usual routine. This one is really no trouble at all. The trouble with salsa is similar to the trouble with canned tomatoes. Last weekend I convinced Chuck to join in the preparation of tomatoes, onions, and peppers. Since he is the main consumer of salsa in the house, it was only fair. Thoughtlessly rubbing his eye after dicing a jalapeno pepper? Well, that was only careless. Ouch. In which Daisy discoveries the peas didn’t do well, but the beans? Stay tuned. The peas, those lovely little vines that filled the space in between the random flowers, didn’t bear fruit. They produced a few tiny pods, but no peas. I don’t know if it was soil troubles, a hot & dry spell, or other issues, but my garden produced no peas. I pulled the plants and set them on yet another section of garden that didn’t produce any produce. When they dry, I’ll toss the whole pile in the compost. Beans, however, are looking great! They’re bushy as bush beans can be, reaching for the sun with their lovely little leaves and producing flowers and actual green beans. Yum! I have enough beans in the freezer already, so everything I harvest will be supper. Or lunch. Or raw beans for a snack (oh, yeah, they’re that good). Meanwhile, I made a few decisions. The area with the non-producing pea plants will be devoted to flowers next year. I’m seeing more pollinators, so I’d like to keep them happy. The sections that just didn’t grow are getting an infusion of organic matter (a.k.a. compost). As for behind the garage, the raspberries are coming back, little by little. Chuck trimmed a tree that was overreaching its borders (at the edge of the next door lot), and that helped allow more light into this area. I spread lots of parsley seeds so the parsley plot can expand even as the raspberries try to take over. Last, but never least, some of the bulbs for walking onions were trying to sprout in the tray where they were stored. I dug two shallow trenches and tossed the bulbs in. If they don’t come up this season, they’re likely to bloom next spring. And that’s the current status of the Backyard Garden, folks. It was a wonderful night in June – good weather, nice breeze, rain in the forecast. The rain barrels were ready, and most of the garden was planted. I’d been filling in a few spots here and there, just to see how the combinations would work. Carrots, turnips, parsnips alongside the tomatoes; a few more peas near the flowers; beans galore. The sun was going down as Amigo and I went inside. It was a good night for sleeping. Cool, a steady rain, nice breezes. I woke up refreshed and ready to check on my garden plots and pallet experiment. But when I looked outside, I saw something ominous on the picnic table: my basket of seed packets, soaked through. AAAAAUGH!!! My first reaction was to try to fix it. Dry them out! Use the oven on super-low setting! Try the grow lights! Dry the seeds before they germinate all at once! Well, they dried, but I’m still not sure they’re viable. Since some of my seed packets were more than a year or two old, I decided that this will be the year I throw them all away in the fall. I’ll start fresh with new seeds and no more hoarding. Well, maybe no more hoarding. Seeds don’t take up much space. In the meantime, I’ll play around with what’s left. There’s nothing to lose, after all. There are large sections of my garden that are only growing weeds, anyway. I might as well toss a few seeds here and a few more there. So, readers, I’ll share the results with you soon. So far, parsnips are going nowhere, dill is hibernating (and the dill seeds didn’t get soaked with the rest, either). Lettuce looks promising, if the chipmunk will stay out of the way. Predictions, anyone? Will the damaged seed stock be any good? What kind of results do you expect? It’s transition time at the Farm Markets in my region – the transition between pea season and green bean season. I suppose I should include yellow beans and purple beans, too, but mainly I buy the green. This recipe turned up in my employer’s wellness newsletter. I wonder if it would work for the purple, without losing the color? Heat oil in a large skillet over medium-high heat. Add red pepper flakes and stir to coat the pepper in the oil. Add green beans and cook, stirring often until the beans are blistering and browning in areas, 5-7 minutes. Add garlic and salt and cook, stirring constantly until the garlic is fragrant and browning, about 30 seconds. Add water and immediately cover. Cook covered until the beans are right green and crisp tender, 1-2 minutes. Serve immediately. With fresh green beans from the market, this sounds awesome. Readers, how about those yellow and purple beans? Any opinions? Why Doesn’t my Garden Grow? Three major section of my raised beds are growing nothing but weeds. I have a few theories, but I’m not entirely sure. I’m hoping to narrow down the possibilities so I can figure out what to do about the problem. The basket of seeds got soaked when I left it out overnight. I successfully dried the packages, but did I manage to destroy their viability? I like to stock up during late season clearance sales. The seeds I used could have been old. Birds! I suspect cardinals in the demise of my butterfly garden seed mat. Chipmunks! Or chipmunk! Darn thing slips through the tiniest gaps in the fencing, and I find holes all over. Rabbits? Not likely this time. The wire fencing is pretty good. Poor soil – doubtful. Treating my soil with compost, etc., would take a number of posts. The green “walking” onions around the edges are growing beautifully, too. Incidentally, the pallet garden and the various containers are doing very well. Herbs, mainly, along with a few leafy edibles and flowers, all thriving. The rest? I’ll keep trying to make it work. Promote growth. Plant something that comes up, already. Readers, suggestions? I have a gauge for testing soil pH. I might try that. What else do you recommend? 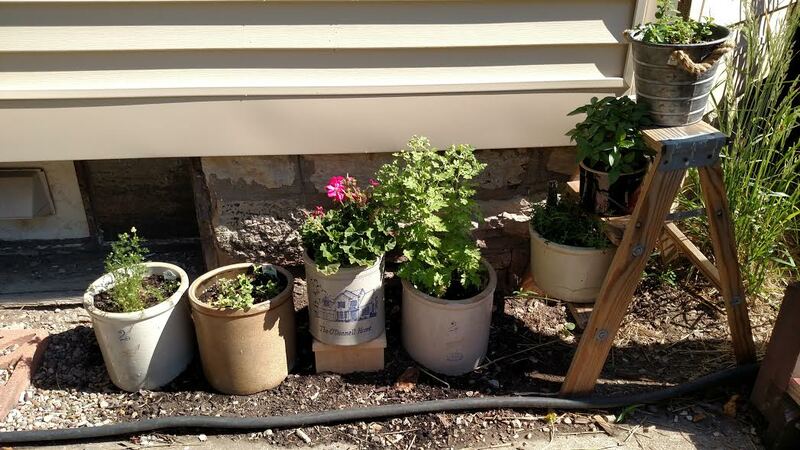 Here’s a picture of last year’s Crock Garden. I reused a few of the same crocks this June, and I have a couple of new ones. I’ll share – well, I’ll plan to share. Good intentions and all, right? Just a few feet away sits the Rock Garden. 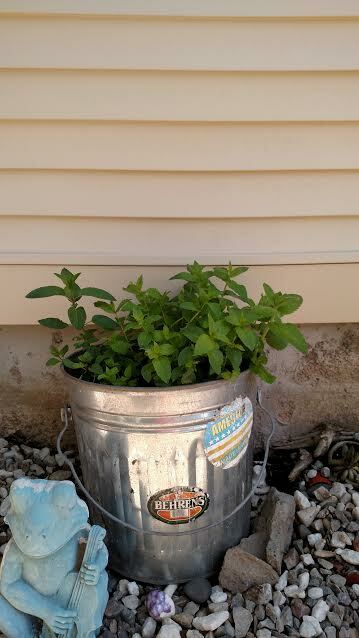 In the rock garden is a large bucket filled with mint. That’s Amigo’s alter ego on the left: the frog playing cello. I have more to share in the Rock Garden, too. I’ll share soon – at least I intend to share soon! I’m a forager wannabe, as my regular readers know well. I’ve been known to pick dandelions for the rabbit and to incorporate into salads, pesto – you name it. When Chuck and I take walks, we’ve learned the location of raspberry bushes that no one harvests. I have my perennial rhubarb and a raspberry patch that is slowly but surely recovering from its near-destruction in the building of the new garage. I have my annual garden patch with tomatoes, peppers, and whatever decides to bloom where I plant it. So far, that includes potential for zucchini, spinach, parsley, peas, and perhaps butterfly garden flowers. Maybe. 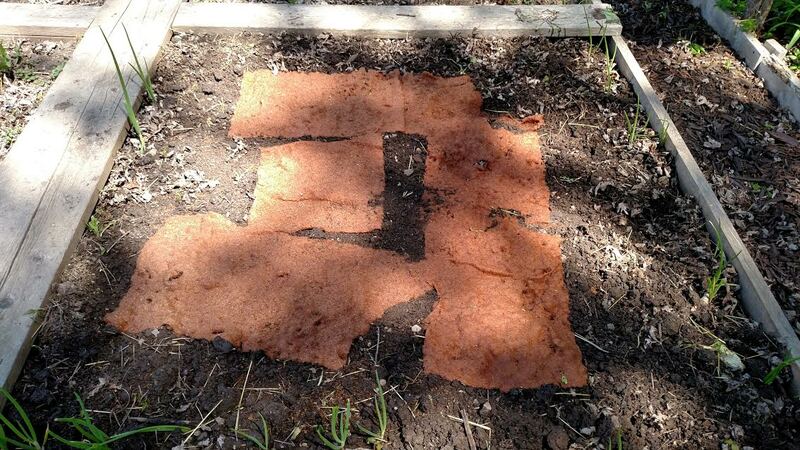 I bought the butterfly garden seed-infused mat from a recent online auction. My main objective in this auction was a 10 inch cast iron skillet, and as long as I was bidding, I dropped a minimum bid of $2 on the butterfly garden. Now, I have no idea how old this batch of seeds might be, or how many of those seeds were stolen by the cardinal family in the backyard. I tore the mat apart to spread it out to fill the space, and it fell to pieces. Is that good or bad? No, don’t answer that. Here’s the result. Lovely? Not yet. I planted peas in the spaces in between the mats. But I’m off on a tangent. I didn’t start out to talk about the potential butterfly garden. I actually started out talking about foraging in the great urban-slash-suburban cityscape. I was at a most unlikely place when I saw asparagus growing. The airport, my friends, it was the airport. While waiting for Petunia’s plane to arrive, I kept myself busy playing Pokemon Go. Out of the corner of my eye, I noticed that a gravel landscape between the parking and the pick-up areas had a speck of green in it. The wind was blowing hard and blowing cold, so I did not get out of the minivan to take a close-up. The signs that said “No Unoccupied Vehicles” might have had something to do with that, too. Well, there you have it, people. 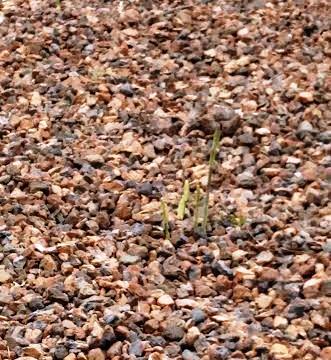 I found asparagus growing in the gravel at the local airport. Foraging now is simply fun. If it ever becomes a necessity, you’ll want to be with me. No matter where we are, we’ll stalk something edible.